One autumn morning, three people arrive at work expecting an average day. Minutes later, their world explodes into chaos. Thrown into existential crises, they’re forced to reconcile their situation and face the possibility of their own deaths, learning what it means to die, but also what it means to live. This is not theatre from the edge, from the “fringe”. This is not your clown/magician/standup/ improv/experimental theatre. This is theatre from the heart of theatre. The kind of theatre where you get to feel the quiet power of drama. The kind that makes even the word “play” seem all wrong. “Before the Fall” is a deft and thoroughly engaging exploration of how the mind will bargain and try to escape an increasingly inevitable fate. Not of the gods, but just because real life isn’t fair. Catharsis trumps victory. It’s absolutely excellent acting delivering a well focused, well paced script. Everyone in London associated with or interested in theatre should see this. We are lucky to have it in our Fringe. P.S. Theatre so real it actually has a program. Wonderful acting and superbly written. I left with tears in my eyes. Highly recommended! What a good show! Definitely go and see it. Great performances by all three actors, great script, set and costuming perfect. The content kept us on the edge of seats, kept us talking long after the show was over. Powerful emotions were so well done. I can’t say enough. This play is a ‘must-see’ !!! The characters are completely relatable and their emotion is intense. This is about real life…and it will change yours. I would HIGHLY recommend seeing this play! The acting is fantastic to bring this historic tragedy to life in the perfect short span of time of the production, which matches the short time victims in the twin towers during 9/11 had to decide what to do. The talented playwright, who is also one of the actors, wrote each character’s part in such a thought-provoking manner, that I’m still contemplating how to better live my life & take charge of what I can change. I’ve never experienced so many emotions at any other play I’ve ever seen. This is the real deal. Theatre as good as it can be. Very good script, well structured, well directed, and the cast is equally superb. Thank you for a truly memorable show. There is theatre and then there is THEATRE. Before The Fall falls into the latter category. You know you’ve been witness to something special when during a performance you laugh, you cry, and you are still talking about it the day after… and the day after that… and then you line up to see it again. This play is incredibly well written and each actor is so captivating, they we able to make me forget that I was sittting in a venue filled with other people. It was just me, and them. Their story allows us to look back at a tragic event and start to explore within ourselves, the same things they are exploring on stage. How are you choosing to live? Are you really living, or are you just existing? Judging by the previous reviews I am clearly alone in my views. I was not moved because I did not believe the performers – I was watching actors saying their lines. Life is about a series of choices. We should be used to that… after all, we make choices every day. Some turn out well, some force us to change direction, and some… well let’s just say if we had a “do-over” we would try something different. Some choices are easy… Coffee or Tea? Walk or drive? Take an umbrella or put on sunscreen? If we make the wrong choice, we face the consequence and hopefully learn from the experience. No big deal. Some choices are harder… To stay with a job that is just a paycheck or take a chance and try something you have always wanted to do? To stay in a safe relationship or get out and try again? These choices are harder to make and we carefully weigh out both sides; the consequences will be life changing. And some choices are forced upon us… completely outside of our control… the result of someone else’s actions that we can’t change. We face a medical emergency. We lose a loved one. We find ourselves in a situation with no apparent way out. Suddenly, the universe spirals out of control, and we are hurled off in a new direction, facing a new set of choices. “Before the Fall” is a play about making choices… the easy ones, the hard ones, and the ones that seem to be outside of our control. It is also a play about living life, and appreciating what we have, and accepting the choices we make, even when the universe is moving us in a different direction. As we approach the final weekend of The Fringe, you might only have one or two choices left for plays you want to see. Choose wisely. 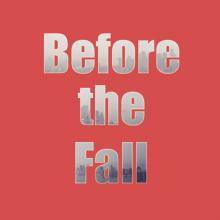 If you want a play that explores how choices affect lives, see “Before the Fall”. It might make you laugh. It might make you cry. Or it might remind you that life is what happens when we aren’t really looking, so grab on with both hands and hold on tight.